I promised myself when I got our book writing done, I would take a break from testing and re-testing my own recipes, and cook something new. Try some different food cultures, expand my culinary vocabulary and explore. After a tapas meal in Chicago, I found myself pocketing the menu and vowing to learn Spanish (food). As usual, I tucked the menu away. Who knows where it went. 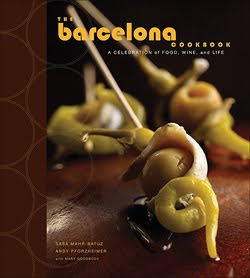 But, like magic, The Barcelona Cookbook showed up on my doorstep. In an act that is COMPLETELY out of character for me, I actually made a couple of the recipes exactly as written. The first pick was the Romesco sauce on page 133. It calls for an entire head of garlic plus three raw cloves. I love garlic. I love Romesco sauce now. The second recipe we tried was Costillas de Cerdo, a braised pork short rib with a citrusy, anise and smoked paprika sauce. I brought this to a girls' night dinner. There were some dainty salads and veggies gracing the table. But, the reaction was joy when I thunked down two slabs of RIBS. Girls gotta eat, too. They were devoured happily and without forks. I've marked a few recipes more to try and have been spending some quality time with the section on Spanish wines, the guide to cured meats, and essay on the tradition of Asados. This actually a tradition from author Sasa Mahr-Batuz' home in Argentina. The asado is a large weekend barbecue where everything is casual except for the amazing food with a grill at the center. I love this section. It reminds me of the very casual way we entertain, often making the call to guests just hours ahead and always serving up the best of the season. Authors Mahr-Batuz and Andy Pforzheimer should know a few things about entertaining. The two are owners of the Barcelona restaurant group. 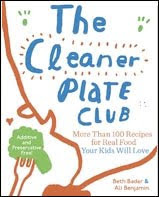 Most of the dishes in the book have graced the highly-praised restaurants' menus as well. For my first venture into Spanish, the two are very fluent and capable tour guides. Tomorrow night? Goat Cheese with Mojo Verde.